Ralph Daykin, Gunnerside. Another clock has recently come to light in the USA. 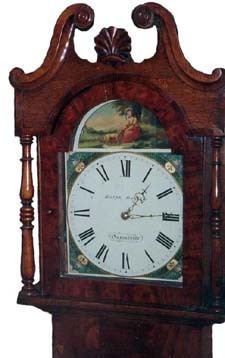 Wall clock noted c. 1880. Margaret Batty’s book Gunnerside Chapel and Gunnerside Folk lists a Ralph Daykin as a clock dresser living in the village in 1875. Two letters written by Ralph to brothers in America can seen in the Archives.